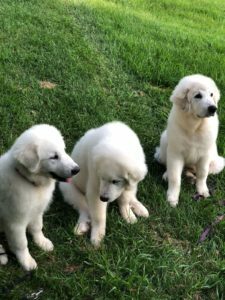 We recently adopted three Great Pyrenees puppies. They are now 18 weeks old and growing fast! Like most dogs, they LOVE treats – but a lot of puppy snacks are made with harmful ingredients. To avoid the chemical food additives and industrial solvents found in most dog treats, I decided to make my own. I used the tougher cuts of meat from the cow which aren’t ideal for human consumption but are perfect for the pups. There are hundreds of recipes for fancy treats online, but my recipe is pretty basic, simple and clean! It is literally just organic beef. Organic is always best, as organic foods are derived from ingredients produced without modern synthetics, pesticides and chemical fertilizers. Tip: this is a great way to clean out your freezer and use up those pieces of meat that may have been in there a bit too long, as your dogs won’t mind if the meat is a bit dry from being in the freezer! Select your meat – you can make your own dog treats using many different types of meat, from chicken, turkey, beef, venison, or salmon. Line cookie sheets with tin foil or parchment paper. Slice the meat into even slices, about 1/4 inch thick. Arrange the meat on the cookie sheets. Cook in the oven at high heat and keep an eye on them. The idea is to cook the meat until it is fully dehydrated, creating chewy treats for your dog. Drying times vary based on the temperature, thickness, and type of meat. There can be no moisture in the strips, especially in the center of each piece, so make sure to cook long enough to fully dry the meat. Not only will your dog love these treats, but feeding your dog organic foods will keep them healthier and happier. Longer, Happy Life: What you feed your dog will have a strong impact on your dog’s health well as how they act, look and feel. Higher quality ingredients help your dog to have healthy energy levels, a healthy weight, and a strong immune system to maximize your dog’s life expectancy. Not only that, but your dog’s coat will thank you too! Dogs fed with proper nutrition tend to have soft, thick, shiny coats of fur. Fewer Digestive Issues: Because organic dog food does not contain bulk-fillers, your dog consumes only what it needs to stay healthy. In organic, natural foods, there are no chemicals or artificial ingredients, making it easier for your dog to digest. Dogs don’t consume as much when the food is nutrient rich, so ultimately your dog eats less and eliminates less when on an organic diet. It’s a win-win for you and your pet as they tend to have more predictable bowel movements, with firm, less smelly stools. 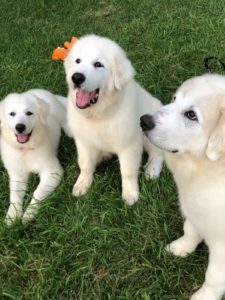 Reduction of Skin Ailments and Allergies: Certified organic dog foods contain quality ingredients, like proteins and grains with high nutritional value. By eating these quality ingredients, your dog’s immune system will be stronger which helps to build a stronger resistance to skin infections and other illnesses. Furthermore, organic foods are free of toxic pesticides, artificial colors and flavors, and chemical additives which could be the source of your dog’s allergies. Stronger Immune System: Organic food contains higher quality ingredients, which are more easily absorbed when digested. The result is a healthier dog and stronger immune system, which can prevent infections and illness. Natural and organic foods provide your dog with all the fuel they’ll need to maintain healthy energy levels and stay active.